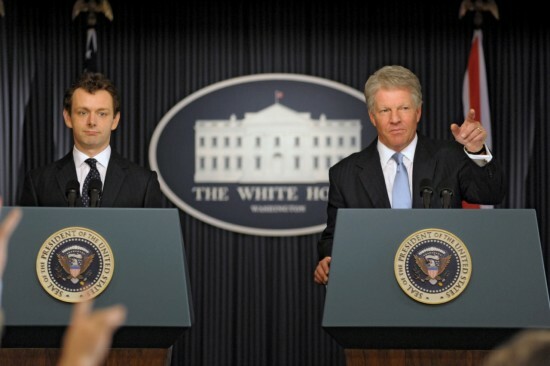 The Special Relationship is an historical drama that tells the story of Tony Blair, Bill Clinton, and the Anglo-American relationship. The story begins with Blair as an aspiring politician on a study tour to the US, getting pointers on how to reshape the UK Labour Party. The Democrats were keen to see Labour returned to office, just as they had defeated the Republicans in the race for the White House in 1992. Blair makes another trip to Washington on the eve of the 1997 elections, where he’s given the red carpet treatment, reserved for serving heads of state. The rest, as they say, is history. Michael Sheen reprises his role as Tony Blair, who he also played n Stephen Frears’ The Queen (2006) and 2003 telemovie, The Deal. Helen McCrory is also back in familiar territory, having played Cherie Blair opposite Sheen in The Queen. Sheen lacks conviction, and seems to be cruising through his role, but McCrory is again superb as the UK’s first lady. Dennis Quaid is convincing as the controversial Bill Clinton, evoking his manner without resorting to mimicry, at a time when he was mired in the Monica Lewinsky affair. This scandal eventually led to Clinton’s impeachment – the only president to suffer this fate since Andrew Johnson in the 1860s. Hope Davis plays first lady Hillary Clinton and Adam Godley Blair‘s advisor, Jonathan Powell. Davis sounds more like a housewife than the ambitious Hillary. We only get a glimpse of the real Hillary when she’s elected as a member of the US Senate. I must admit, I had very high expectations of this film. Although there are some interesting and tense moments between Sheen and Quaid, the film treats most issues in a rather superficial way. 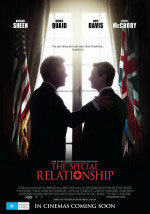 Overall, The Special Relationship is entertaining, but it lacks the subtlety and insight it could have had.